This description covers use of the prototyping system, known as the 'enamel wiring pen' technique (EWP). 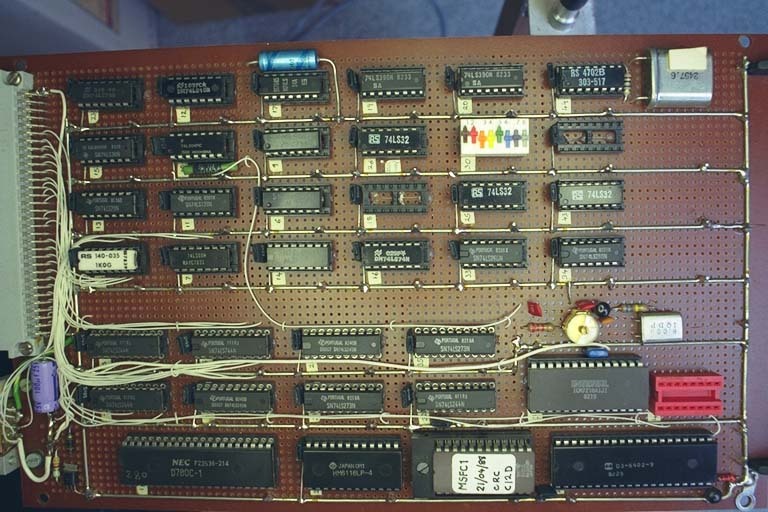 The aim is to show in detail how it may be used to construct digital logic circuits and to compare the technique with others commonly used, principally wire-wrap (WW). 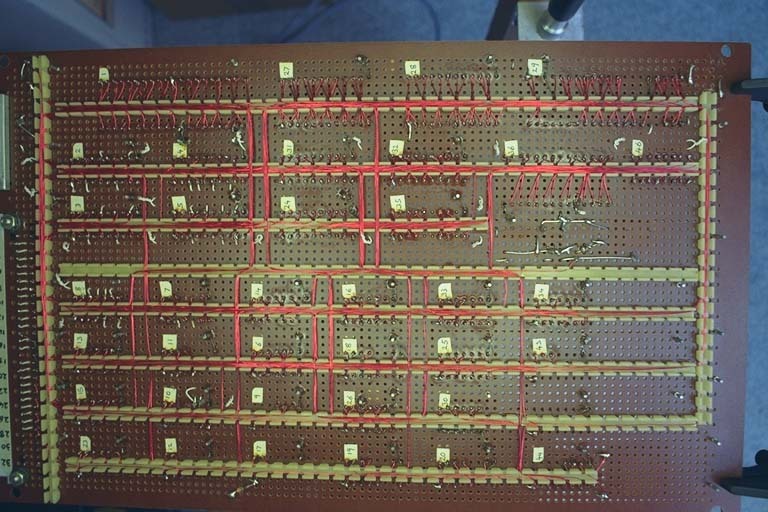 You can view a photo of components on a board made using this technique and another showing the reverse or wiring side of it. What advantages and disadvantages does the the EWP method have relative to the WW or Printed Circuit (PCB) alternatives? Cost. EWP is cheaper than the WW method because it does not need special IC sockets (not available from Electrical Engineering Stores) or board connectors. It is even possible to do without sockets at all. The board can be one of the commonly available fibre-glass or SRBP matrix types and does not need any copper tracks; these are a fifth the price of normal protyping PCBs. The wire is available from stores, though if bought in bulk, is cheaper than WW 'Kynar'. The special strips needed for EWP cost about 4p for each IC. Layout density. Where absolutely neccessary, ICs can be placed without gaps between ends or sides or both; although extra room will normally be needed for decoupling capacitors etc.. The populated boards may be stacked on a 15mm pitch. With WW, more space is taken up with the long socket pins which are vulnerable to being bent. Speed. A layout may be designed almost as fast as a PCB, which also requires time for us to etch and drill etc., particularly if you must first become familiar with the layout software or supplement its library files. Modification to an EWP layout is usually easier than with a PCB and requires no track cutting. It is, though, slower than WW and needs a little more care. Unlike the standard WW technique, the wire requires no stripping before use nor cutting into separate lengths for signals traveling to multiple destinations. In other words, it is possible to 'daisy chain', say, a data bus line which may go to several ICs. Once all the wires are in place, there may be only one practical method to verify that a signal line is connected to no other point than those intended - and that is to remove the line altogether. This is a tedious operation! If you require more than one copy of a board then a PCB becomes attractive. Reliability. The failure rate of an EWP board is as low as other techniques but will depend upon the care taken in construction. Proficiency in the use of EWP requires rather more practice than with WW but even first time users produce boards capable of good service. Signal cross-talk is theoretically higher with EWP than WW but is not a problem in practice at frequencies below about 10MHz. The bus lines on a PCB are frequently run as close as 0.02" apart - that is 1/5 the width of an EWP channel. Furthermore, in contrast to a PCB, wires within a channel will rarely lie adjacent to each other for very far - other wires tend to become interposed (by accident or design). Other points. It is slightly easier to connect discrete components using EWP than WW. The current rating of EWP wire is less than 'Kynar' but will be adequate except for ground lines, where 'Kynar' alone may be marginal anyway.